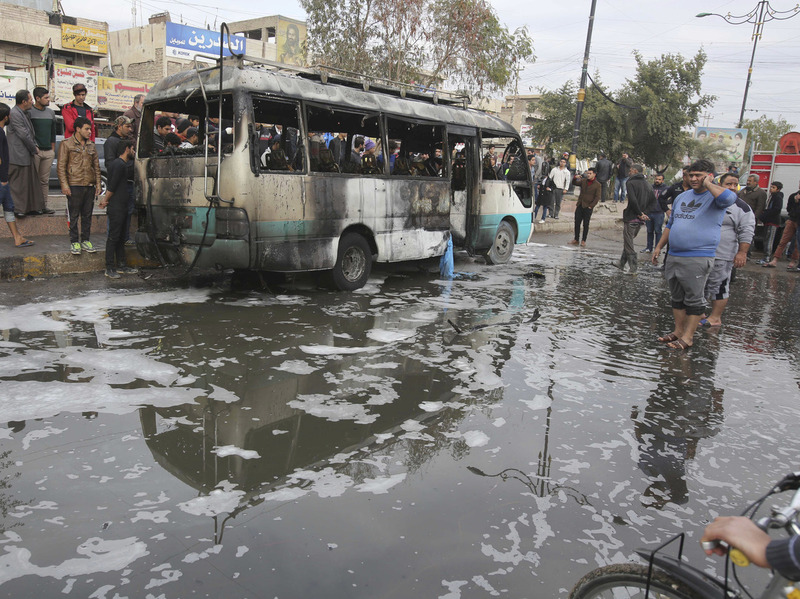 Dozens Dead In Multiple ISIS Bombings Across Baghdad : The Two-Way Baghdad has seen a spate of deadly ISIS bombings in the last several days. On Monday alone, five blasts rocked the capital city, NPR's Alice Fordham reported. Bystanders inspect the scene after a car bomb explosion at a crowded outdoor market in the Iraqi capital's eastern district of Sadr City on Monday. The first attack came in Sadr City on the edge of Baghdad, still reeling from a bombing on Saturday. The bomber pretended to be recruiting casual laborers for the day, so those killed were mainly poor manual workers. The next ones came at roughly the same time near two hospitals in the city, followed by three bombs in the poor Shaab area of the city. The BBC reported that at least 35 people were killed and at least 61 injured by the blast in Sadr City, which is a "predominantly Shia Muslim" neighborhood. The BBC wrote: "The Sunni jihadist group Islamic State said it had carried out the attack, which 'targeted a gathering of Shia.' "
Reuters reported that "nine of the victims were women in a passing minibus." The news service wrote: "Their charred bodies were visible inside the burnt-out remains of the vehicle. Blood stained the ground nearby." The attacks followed other bombings in the city on Saturday, which killed 28 people, according to the BBC. Reuters wrote also wrote that "an attack near the southern city of Najaf on Sunday left seven policemen dead." Monday's attacks coincide with an Iraq visit by French President Francois Hollande. Hollande gave a press conference with Iraqi prime minister Haider al Abadi, vowing to defeat ISIS. "The terrorists will attempt to attack civilians in order to make up for their losses, but we assure the Iraqi people and the world that we are able to end terrorism and shorten its life," Prime Minister Haider al-Abadi said, according to the BBC. The ISIS bombings come as Iraqi security forces continue their offensive to push the self-proclaimed caliphate from the country. The U.S.-supported offensive was launched in mid-October, as the Two-Way reported, and has recaptured part of the city of Mosul, the terrorist group's last major stronghold in Iraq. According to Reuters, "Abadi has said the group will be driven out of the country by April."